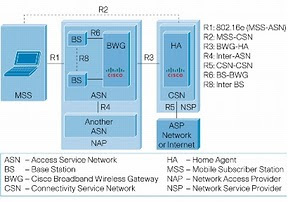 The Cisco Broadband Wireless Gateway (BWG) is an essential piece of the IEEE 802.16e (WiMAX) architecture. As the Access Service Network (ASN) Gateway, it provides aggregation services for the Radio Access Network (RAN). Cisco first released it's BWG software in late 2007. Since that time, a considerable number of new features have been added. Two of these features (session redundancy and load balancing) were not supported on the Cisco 7301 platform. Cisco BWG 1.1 was the first release to carry the BWG name. This bug fix release included no new features or hardware support. It fixed several problems with the Cisco Service and Application Module for IP (SAMI) cards and a DNS cache poisoning vulnerability. Cisco BWG 2.1 introduced no new features. It did however resolve a number of bugs. This release was issued just two weeks after Cisco announced the end-of-life schedule for the BWG platform. It is being replaced by the ASR 5000.